Despite Apple's current struggles with the much-maligned Maps app, the company is still enjoying quite a bit of success. Even though Maps' struggles have been highly publicized, there are still plenty of consumers interested in purchasing an iPhone 5. A new study from ChangeWave not only revealed more consumers were interested in the iPhone 5 than they were the iPhone 4S, but also that an overwhelming percentage of Maps users had no issue with the app whatsoever. ChangeWave's numbers found 19 percent of people polled were "Very Likely" to purchase an iPhone 5. In fact, the iPhone 5 results outclassed those of the iPhone 4S in every single category in ChangeWave's survey. Additionally, ChangeWave polled current iOS 6 users in an effort to find out just how much of an issue Maps really was. The majority of respondents, 90 percent, reported having no issue at all with Maps, while only 3 percent of those polled said Maps was a "Very Big Problem." "In comparison to the iPhone 4 Antenna/Reception issue, the current Apple Maps issue is of marginal concern to iPhone 5/iOS 6 users," said ChangWave in its report. "Simply put, Apple Maps is not considered a problem by the overwhelming majority of users." 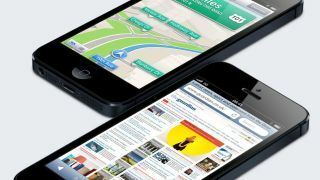 Perhaps even better news for Apple is the latest Chitika web browser report, which gives the iPhone 5 the lead over its competitor, the Samsung Galaxy S3. With Apple already holding onto 72 percent of all smartphone web traffic, it should come as no surprise to learn the iPhone 5 is again leading the charge against its chief rival. Pitting only the web traffic generated by the iPhone 5 against that of the Galaxy S3, Chitika found a slight majority in Apple's favor. The iPhone 5 is responsible for 56 percent of all web browsing between two smartphones, compared to the Galaxy S3's 44 percent. Considering the iPhone 5 is only a few weeks old, and Samsung's smartphone has been out for months, that much of a gap already existing between the two is quite impressive. Teamed with the record-breaking sales of the iPhone 5, Chitika said "new 4G browsing speeds which encourage data usage, are the most likely explanation for this tremendous growth." If those ChangeWave poll-takers soon pick up an iPhone 5, that gap could grow even more before the end of the year.